Often, when a movie or a novel wants to use a truly vapid slogan for a pretend political campaign, the writers will fall back on the phrase “Now more than ever.” It’s so broad and vague as to be utterly meaningless. Yet it’s precisely what popped into my mind today when I thought about the pressing need for educating the public, both young and old, about the wonders of the United States Constitution. Afghanistan, a Muslim country, has nothing close to our Constitution. There is no freedom of speech (which our Supreme Court long ago said included burning symbolically significant items, provided the burner isn’t destroying someone else’s property); no freedom of religion (in Islamic countries, apostasy means death and members of other faiths are killed, enslaved, exiled, or subject to second class treatment); and no due process. Mobs exist everywhere, of course, but the ethos in America is (or used to be) freedom of speech and religion, as well as due process. The second thing that reminded me how important our Constitution is was a lunchtime conversation revealing that, thanks to one hundred years of Leftist attacks on the Constitution, too many people in America don’t appreciate its centrality to the free, prosperous lives they enjoy. We already have way too much evidence that today’s young people, raised in the incubator of public schools and American universities, will cheerfully disavow any Constitutional rights to speech, religion, due process, etc. What’s so disturbing is to see that this disregard for the Constitution has filtered upstream to older people who should know better. It started today with a lunch-time trip to Chick-fil-A, a destination that the teens enjoy because it’s tasty fast food served in a rather civilized setting. With us was a highly educated 50-something who grumbled about going there because the company’s owners are “homophobic.” I explained to the teens that there’s a difference between being homophobic and opposing gay marriage. I, for example, am not homophobic, but also do not support gay marriage. When the United States came into being, European countries did not separate church and state — especially England, which was the dominant cultural influence on America, where the head of the state is also the head of the church. Marriage was therefore simultaneously a religious and a civil institution. When America came into being, it never occurred to anyone that marriage has two distinct aspects: religious, which involves a religious institution joining two people before God, and civil, which sees a government formally unite two people for the purpose of bestowing upon them all sorts of government-approved benefits, including tax breaks and parenting benefits. As long as society agreed that marriage was a man-woman thing, this melding of church and state worked for marriage because, while religious institutions and the government had different benefits to offer, both those benefits went to the same type of union. Gay marriage, however, revealed a schism: Not only to religious and civil institutions bestow different types of benefits on “marriage,” they also define marriage differently. The intelligent way to approach gay “marriage” would have been for the government to get out of the “marriage” business and get into the “civil union” business. This would allow it to bestow a civil blessing on whatever the heck kind of unions the public will accept. What happened instead was that Anthony Kennedy found a magic, invisible gay marriage clause in the Constitution. The inevitable result of the Supreme Court’s decision — and one the more politicized gays on my real-me Facebook feed are lusting after — will be a profound Constitutional crisis as gay marriage proponents attack religious institutions for refusing to perform gay marriages. The Supreme Court will then be asked which Constitutional right trumps in that situation: the magical, invisible gay marriage right or the explicit First Amendment religious freedom right. If we get another Democrat president in the White House (or Donald Trump, who is pulling an Obama/Hillary on gay marriage and “evolving”), and with that President one or two new Supreme Court judges, there is no guarantee that the explicit First Amendment religious freedom right will win. If you doubt me, look at how gay marriage has trumped traditional religion in England. I know that seems like a lot of content, but if you talk fast, you can say all of the above in 90 seconds. 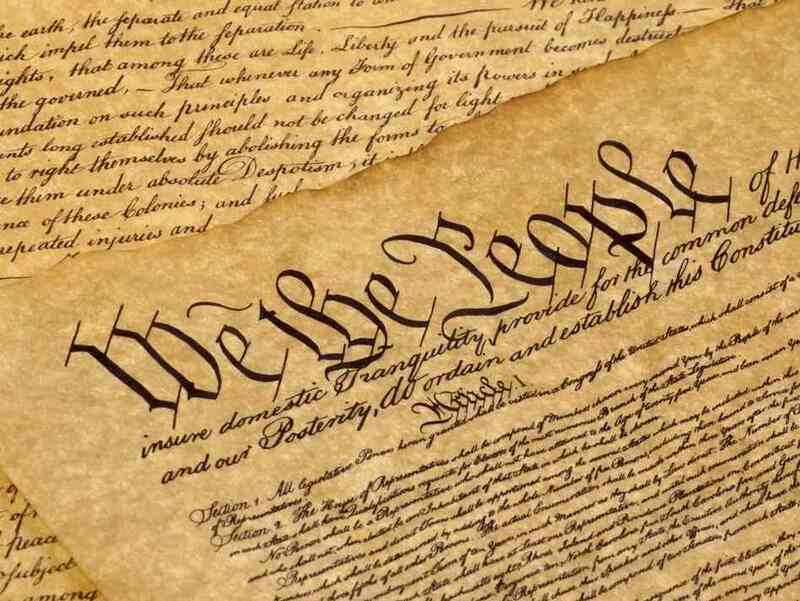 As you know the Constitution is America’s fundamental law and the bulwark of American liberty and prosperity. Today it is under siege, and restoring its predominance in our government is the key to reviving and securing liberty for our children and grandchildren. This is the crisis of our time—and it’s one you can partner with us to solve by making your year-end gift to Hillsdale College by December 31. The heart of the problem is that too few Americans today know or understand the importance of the Constitution to liberty. For that you can thank an educational system that has been hijacked by Progressive ideology. Woodrow Wilson, one of the original Progressives, famously said that the goal was to “make the young gentlemen of the rising generation as unlike their fathers as possible,” and that Americans needed to “get beyond” the Declaration of Independence—the charter document of American liberty! This hijacking of our educational system threatens your freedom and mine. Yet I have hope. We know the truth. And with your help, I believe America can return to the limited, constitutional government our Founding Fathers intended us to have. I don’t think it will be easy. In fact, it will likely come at great cost. But a movement is growing. And thanks to you we’ve made great headway in sharing the truth about America’s founding principles –we’re proud that an astounding 600,000 people have already taken Hillsdale’s “Constitution 101” online course. Those who have enrolled in this course tell us that it makes them better citizens—and stronger defenders of liberty. But we need to reach many more Americans, especially as we head into the critical year of 2016. Will you make a generous year-end gift to reach more American citizens with the truth about the Constitution and its underlying principles of liberty? Next year is crucial to the future of liberty in America. Help Hillsdale in promoting and teaching the principles of liberty and the Constitution through a nationwide educational outreach campaign by making a special tax-deductible gift beforeDecember 31. Thank you for all you do to preserve liberty in America. Please consider giving some money to Hillsdale. I’d also like to remind you all of the inestimably valuable Bill of Rights Institute (which I wrote about here). The takeaway lesson from all of the ideas and facts I’ve set out above is that, if we are to save the young people and marginalize those Leftist old people, we need to act and do so fast and hard. Just as the American higher education system has shown how effective misinformation is, we need to start showing how valuable true information and education are.